How are you people? Have you guys been enjoying the weather? Here it is so cold in Bangalore that I just want to cuddle in my blankets and scroll through Instagram while having loads of hot coffee 😊 . Anyway, due to weather changes, my skin has started becoming very dry and I got lot of dry patches around my mouth, nose and on my forehead. 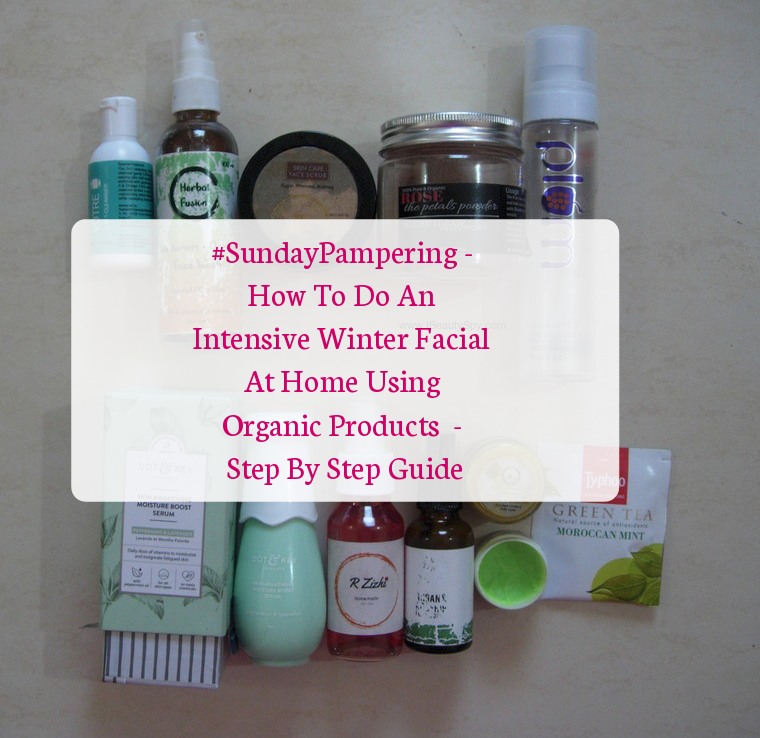 So last Sunday, I thought of doing an intensive winter facial at home to combat the dryness and bring back hydration and nourishment to my dull looking skin. Though it took some time, in the end, my skin was looking glowing, nourished, soft, smooth and pampered. You don’t have to go to a salon to achieve this. You can easily do this at home by yourself. Today am going to be sharing and guiding you with the steps and products that I used to achieve this. This is also a nice way to pamper yourself on a Sunday and trust me, you will feel a whole lot good and relaxed after this session. Here are the steps for the winter facial. A facial should always be started with a cleansing milk. You would have noticed that’s what they do in parlours too. It helps to remove deep impurities from the skin. I used the Votre 3 In 1 Cleanser. It is a vitamin cleansing milk containing vitamin A, vitamin D and omega 3 which are highly beneficial for skin. Take a generous amount than you usually use for your daily routine. I massaged it on my face for 3 minutes and left it on for another 2 minutes before proceeding to next step.You can use any cleansing milk of your choice, but try to go for natural, organic ones. Soultree, Plum, Organic Harvest, etc. Next step is using a water based cleanser. This will remove any other impurities and dirt still on your skin so your skin is prepped to receive all the goodness of following steps. Herbal Fusion is an Insta brand and I have got their Cardamom & Orange Face Wash. You can read the full review here. It deep cleanses skin and leaves it feeling refreshed. For the exfoliating step, I chose an oil-based sugar scrub. Check the texture of it here. Since its winters and dry skin is the issue, oil-based sugar scrubs provide nourishment to the skin while also gently removing dead cells. This scrub from BioBloom is enriched with evening primrose oil, grapeseed oil, almond oil, orange and nutmeg essential oil. It exfoliates the skin well leaving behind smooth, supple and moisturized skin. After this step itself, I could feel my skin was looking slightly plump and glowy. If you are doing this on a weekday and short of time, you can actually stop at this step and move on to step 8. I wanted to use a hydrating and gentle face pack for my dry skin. So the best choice is rose petals powder + curd. I use Blend It Raw Beauty rose petals powder which is really the best. A must try in my opinion. I mixed it with Milky Mist curd which is my favorite curd 😋. Which is your favorite brand for curd? I applied a thick layer on my face and left it on for 20 minutes. Apart from being hydrating, this is also a radiance boosting mask which will restore the glow to your skin instantly. My face looked fresh as a flower after using this. While my face pack was on, I applied a lip scrub. It’s Greenviv Chocolate & Vanilla Lip Scrub. It is very buttery in texture and I applied it like a lip mask actually. I find this more beneficial instead of just scrubbing the lips and washing off, since the ingredients in lip scrub can help to lighten dark lips and pigmentation. Most lip scrubs are just sugar and oil. But this one is more buttery. And I liked the taste of chocolate and vanilla on my lips 😅 . I washed it off along with the face pack and my lips were looking pinkish and rosy 😊 . Also nourished and soft. I would suggest you to apply a lip mask whenever doing a facial routine. As our lips also suffer from dryness and need some pampering. After face pack, I would recommend using a hydrating toner. Am using the Plum Goodness Grapeseed & Sea Buckthorn Nutri-plenish Face Mist. This is just super hydrating, cooling, refreshing on the skin and packed with antioxidants which are going to work on your skin. Just spray some directly on your face generously. You can also use any hydrosols that you have like rose or lavender. Since this is an intensive winter facial routine, we will next use a sheet mask to provide deeper hydration to skin. I used the Mond’sub Rejuvenating Sheet Mask. I usually don’t like Mond’sub sheet masks as they are very sticky after using. But I observed that now my skin is dry, it actually helped in providing deep and long lasting moisturization. Though am not fond of their ingredients list 🙄 . You can also use Innisfree sheet masks which are very good. Or try the ones from Health & Glow which are also very good and have clean ingredients list – Health & Glow Pomegranate Detox Mask, Cherry Whitening Mask, Green Tea & Milk Oil Control Mask. Next step is a water-based serum to provide concentrated hydration. I have the Dot & Key Skin Awakening Moisture Boost Serum which comes in a cute packaging as you can see in the pic. This is basically like coffee for your skin which will awaken dull, tired looking skin. It provides the daily dose of vitamins to moisturize and invigorate fatigued skin. Am using this facial oil from Rzizhi to strengthen my skin barrier. This is a blend of pure dragon’s blood, argan and walnut oil along with 27 herbs and essential oils. Dragon’s blood is the most powerful antioxidant in the world. Just a single drop of dragon’s blood is equivalent to 2 lbs of raw kale or 3 apples worth of antioxidants! I use two pumps of this. After doing the entire facial, this is like feeding nutrients to the skin. My skin loves it and feels healthy with it. Next step is applying a moisturizer or lotion. I got this Fiducia Botanicals Argan & Rosehip Face Lotion which I won in a contest. It has worked amazing for my dry skin in providing hydration and moisturization. Also it contains retinoate which makes it a good anti-aging product as well. I took 2 pumps and its gets absorbed into the skin in a jiffy. As the final steps, don’t forgot to take care of your sensitive eye area. Juicy Chemistry Organic Coffee & Green Tea Eye Cream is my holy grail eye cream. Less than a pea-sized amount is more than enough. It relaxes my eyes instantly. Wrapping up the facial with a lip balm in the end! I love this lemon mint lip balm from Aroma Essentials. This is more like an intense lip treatment and which nourishes lips and prevents chapping and cracked lips. And the mild citrusy lemon flavor with refreshing mint is absolutely awesome! After doing the entire facial, brew yourself a cup of green tea to relax and rejuvenate yourself. This gives a complete spa effect. I had the Typhoo Moroccan Mint Green Tea since I love minty, minty stuff 😀 . Take your time to brew the tea and have it sip by sip while watching your favorite Youtube videos. So there ends the intensive winter facial routine. Try to do this atleast once in two weeks or even once in a month. My skin looks healthy, clear and glowing now. All the dry patches are gone and my skin texture is improved. Its more soft, smooth and supple. And the results are longer lasting than what you would get at a parlor for a hefty price. So the time spent is worth it because the results are not going to last just for a day or two, but for a longer time. Did you find this post useful? Comment below if you are going to try this intense winter facial at home. Rzizhi’s products are on my wishlist for so long. Does Rzizhi face elixir suits oily skin? No, Rzizhi face elixir wouldn’t suit oily skin. Its more for normal-dry skin. 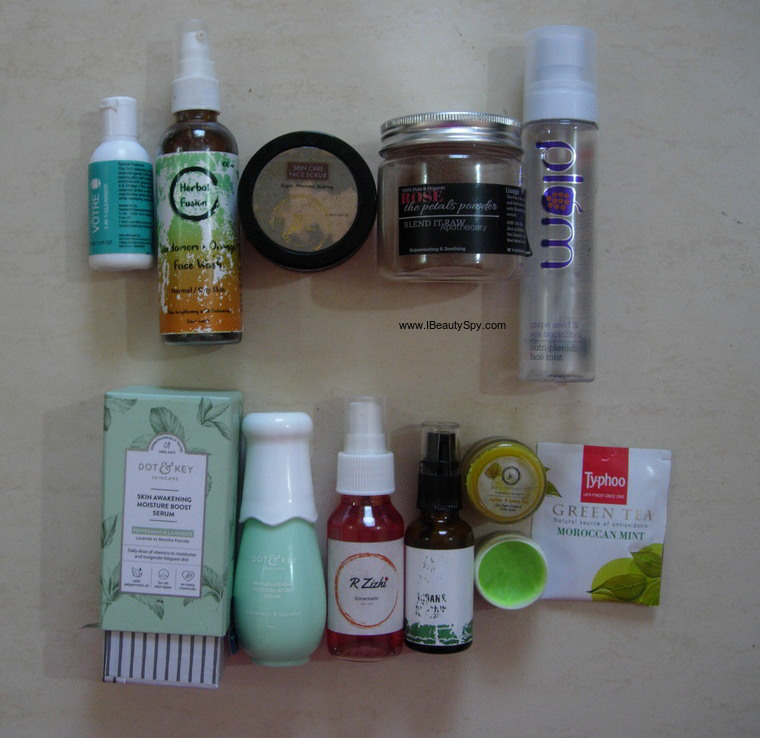 Organic product can do wonder for any type of skin. Thank you for sharing such elaborative article !